We all have that spot where we drop our stuff the moment we step into our home or office. To help you make that go-to spot less cluttered, Twelve South created HiRise 2, the ultimate home for all your Lightning powered devices. This newly refined version of HiRise is one third smaller to free up space, twice as heavy for extra stability and features elegant curves inspired by the newest iPhone design. 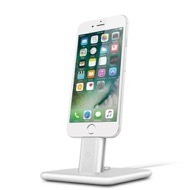 Use this beautiful little stand for hands-free use of your iPhone or iPad, while keeping all your Lightning connected devices fully charged. HiRise Deluxe includes both MFi-certified Lightning and Micro-USB cables to keep your iPhone charged, even in a battery case like the Mophie Juice Pack. In addition to charging, the HiRise 2 creates the perfect place to use your devices hands free. 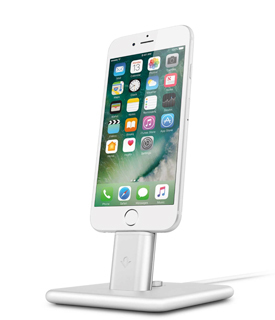 Perch your iPhone atop the stand to raise your screen to a more comfortable height for FaceTime or Skype calls. Unlike many other stands, ours does not block or muffle the sound coming out of your iPhone 7 stereo speakers. Speakerphone calls are crisp and clear. HiRise 2 also lets you use iPhone or iPad mini as a second (or third) screen for keeping an eye on emails or your favorite iOS apps, like those for news, weather and sports. HiRise charges using the Apple Lightning cable, so along with your iPhone and iPad, you can charge your Apple TV Siri remote, Apple AirPods and most third party game controllers. At the office, HiRise charges all Apple Magic peripherals, from Magic Mouse 2 to Magic Keyboard. 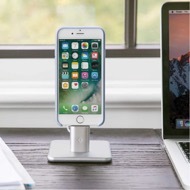 Dock your Magic accessories on HiRise when power is low at the end of the day, and you'll be fully charged and ready for work in the morning. With HiRise 2 you can stay focused and productive without being tethered to your desk. Pair your AirPods or Wireless Beats, plug in your iPhone or iPad, and rely on the power of the port to save you from draining your battery while listening to music or taking long conference calls. You can also park HiRise near your favorite Bluetooth speaker to stream hours of music knowing your iPhone will be charged when you're ready to go. One of best features of this little stand is that it adjusts to fit so many cases. The rear support on HiRise slides back and forth to support protective cases, minimal shells or no case at all. With a sliding rear support and three included height clips, you won't have to give up your dock when choosing your next case. With HiRise 2 you can use even the most protective of cases. Twelve South updated the clip heights to 0mm, 3mm, and 6mm to ensure cases with deeply recessed ports will still work with your favorite dock.